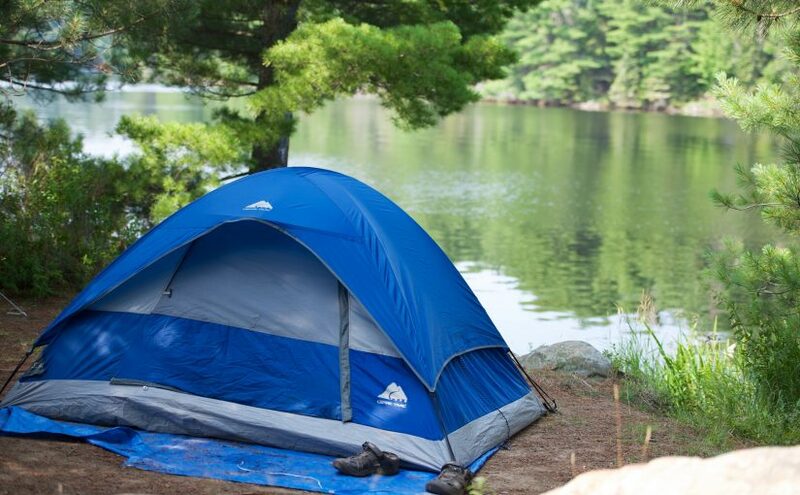 Algonquin Provincial Park is one of the crown jewels of Ontario’s network of protected areas. With endless canoe routes and excellent hiking trails, the park is a Mecca for the province’s outdoor enthusiasts. While the park’s canoe routes offer an opportunity to experience perfect backcountry solitude for the price of a few portages, the hiking trails are another story. The park is built around canoeing and the result is that there are very few multi-day hiking trails. The most popular is the Highlands Backpacking Trail along the highway 60 corridor. During the summer months the trail offers great views across a number of Algonquin’s lakes; but what it offers in majesty, it lacks in seclusion. 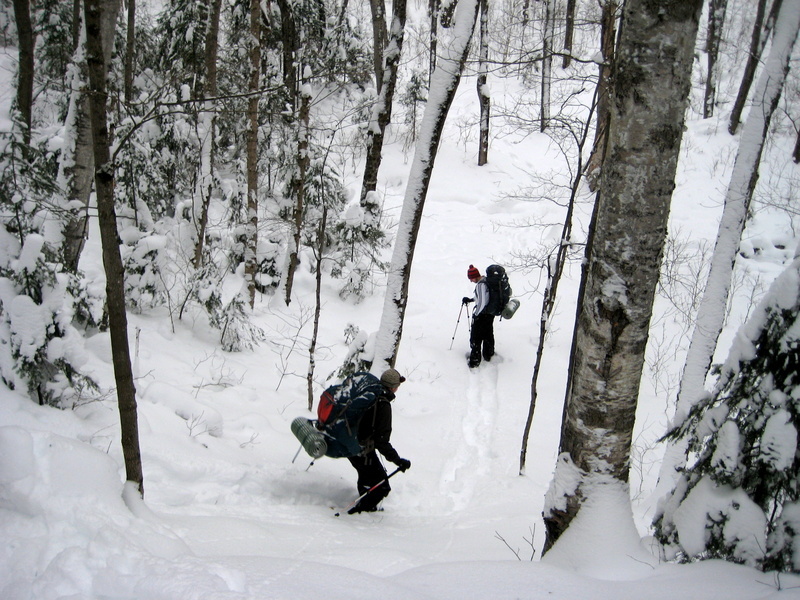 The fact that it is both very accessible and one of only a few trails of its type in the park means that you aren’t likely to be alone at any of its lookouts… That is unless you are willing to brave the Algonquin winter. 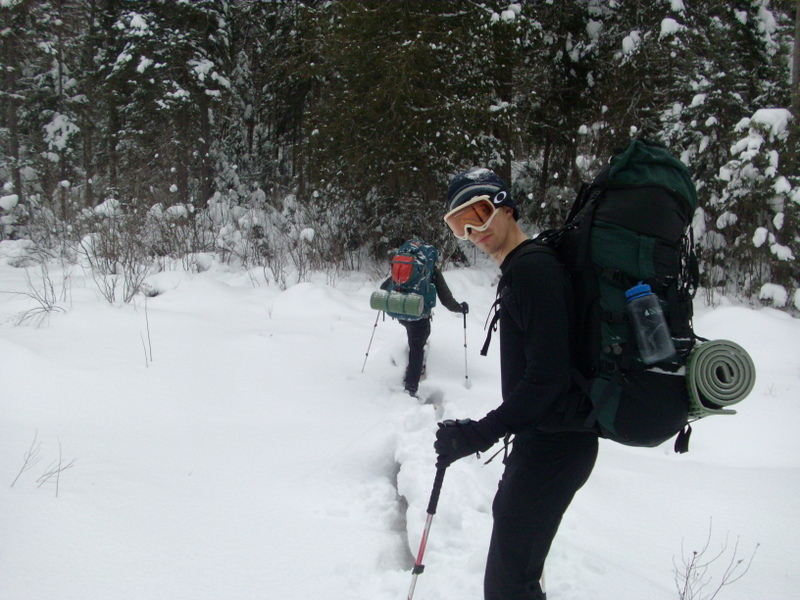 In December of 2010 I laced up my winter boots and strapped on my snowshoes along with my friends Paul and Derek to attempt to complete the 35 km loop in just three days. While that distance is easily achievable in 3 days during the summer, winter offers a whole new set of challenges. We were eager to test ourselves against the cold and the trail but when we arrived at the park office near the west gate the rangers didn’t like our odds. Once their surprise at our proposed route wore off they gave us the standard warnings about extreme weather and the low probability that we could get help from another hiker if we ran into trouble. In the end, they wished us luck and we set off into the woods. The Highlands Backpacking Trail has 2 main loops, a 19 km circuit around Provoking Lake and the longer 35 km route that winds its way from the trailhead to Head Lake and Harness Lake before following Mosquito Creek back to Provoking Lake and the parking lot. Derek and I had attempted the longer loop the previous January but were stopped by deep snow and an inability to find trail blazes in the snowy woods. We were happy to have an extra set of eyes with us this time, as the snow proved to be deep and unbroken. Day One was a day of lessons. As we hiked through the woods we quickly learned to identify small creeks buried beneath the snow after taking a few missteps which resulted in our wet snowshoes becoming blocks of slush and ice as the snow froze to the water droplets and weighed down our feet. We also learned that the trail itself was not without its dangers. Halfway to our first lookout and several hours into the woods we stumbled upon a frozen camp mostly buried in snow. We were relieved when the hammock suspended between 2 trees was empty but were confused by the fully loaded backpack propped up next to it. We later learned from the park rangers that a hiker who had attempted the trail weeks earlier got sick and abandoned his gear to make the hike back to his car possible. Eventually we found our way to the lookout where Derek and I had lost the trail in January. Again we searched in every direction for the next blaze, finding nothing. It was only when we retraced our steps down from the lookout and glanced through the woods that we found the next marker. We followed it down off the lookout ridge and eventually made camp at Head Lake. We were now in uncharted territory. Day 2 was a day of improvising. We hadn’t seen a human footprint since leaving the shorter Provoking Lake branch of the trail and the blazes marking our way were often covered by snow clinging to the trees. The result was slow hiking that often led us away from the trail. It was one such detour that left us scratching our heads on the shore of Harness Lake, not sure where to go next. We combed through the woods and were unable to find any sign of the trail. Eventually we sat down to discuss our options and eventually decided to follow the canoe route across the frozen lake and meet up with the trail again at a distant point of land that our map told us was nearby the path. Snowshoeing across a frozen lake when you are a day and a half from the parking lot is not for the faint of heart. A quirk of winter camping is that even the most frozen over lake will have patches of slush along its surface. The slush is the result of a layer of overlying snow melting the top fraction of the ice. It is perfectly safe, but your brain tells you it isn’t. We carefully made our way across the lake, staying close to shore the entire way. We quickly found the trail after reaching our target outcrop and made our way to the crossing of Mosquito Creek where we made camp for the night. One of the great highlights of winter camping is that the seclusion includes not only people, but insects. Even at Mosquito Creek there was not a bug to be found as we crawled into our sleeping bags on the frigid December night. As the sun rose and we set off on Day 3 we were happy to be within striking distance of our goal. The trail still offered its challenges including narrow, snow-laden tunnels of trees that were all too eager to drop mountains of snow down the back of your shirt if you so much as grazed a branch, but we managed to follow it successfully to the junction with the Provoking Lake Loop. We celebrated our navigational victory with frozen Snickers bars before walking the last few kilometers back to the car. The only thing more satisfying than hiking a beautiful trail in challenging conditions is accomplishing that feat in a place where you were once forced to turn back. 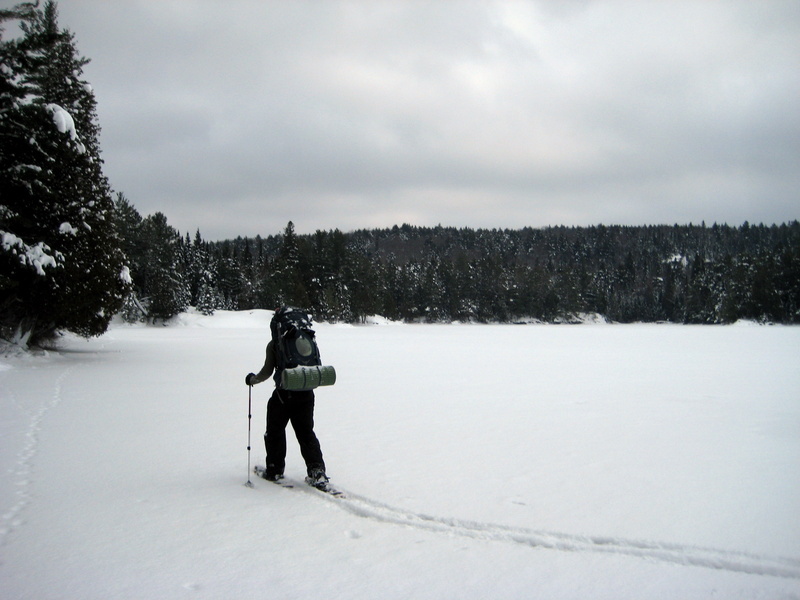 Winter in Algonquin is an incredible experience and it is shocking that more people don’t take full advantage of it. Certainly winter camping is challenging. Cold makes everything from setting up your tent to lighting your stove more challenging, but the rewards are immense. The scenery is enhanced by a blanket of crisp, white snow. You can literally walk on water. The silence and stillness of the woods is unmatched in the summer. 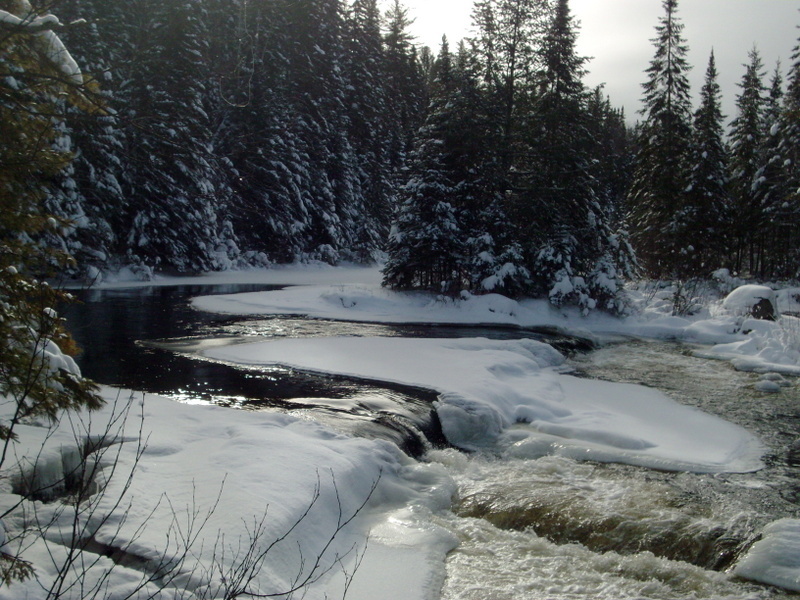 If you are willing to trek through the snowy northern woods, you can experience a whole other world of camping bliss. Hi Steve, great write up, thanks for sharing! I am planning on doing this loop in February and was looking for some beta. Planning on doing it in 4 days to give a little more travel time but was hoping to use my polk. What are your thoughts on this? I am aware of the terrain and plan on packing a light sled and it is an expedition polk with fixed poles so not a canadian tire jobby. I have guided in the Yukon and Temagami so am no novice to winter travel but would still want to avoid scrambles up tech steep terrain. Did you encounter anything like this and what would your thoughts on this? Nothing too steep or technical. I’m not sure what a “polk” is, but based on your guiding experience I’m sure you’ll be fine.